As a basic component of IT infrastructure, networking holds keys to success for service delivery and communication. With the cutting-edge networking solutions, businesses can eliminate the reliance on the conventional networking practices and reduce expenditure on IT infrastructure. As these solutions allow to monitor the network in real-time and control every node, enterprises can thwart attacks like Equifax breach. Additionally, organizations can automate the network controls and inject agility into operations. Networking solutions built on modern technologies like NFV (Network Function Virtualization), OpenFlow, SDN (Software- Defined Networking) power these modern networking solutions. Using these technologies, the solution providers have been connecting businesses with the power of virtualization and programmed networking algorithms. There are several innovative providers delivering cutting edge, policy-based network orchestration solutions. With a portfolio of products that deliver agility, transparency, cost savings, visibility, and automation in the networks, they are giving the networking juggernauts a run for their money. To simplify and help CIOs navigate the networking solutions landscape, CIOReview is coming up with the annual special edition on 10 Most Promising Networking Solution Providers 2018. 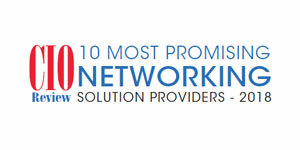 A distinguished panel comprising of CEOs, CIOs, VCs, analysts including CIO Review editorial board has selected the “10 Most Promising Networking Solution Providers - 2018” in the U.S., listing the best vendors and consultants who provide key technology solutions and services related to Networking.